I am a fan of all things oats. Loaded with protein and fiber, but relatively low in calories. The high amount of fiber keeps you with a full feeling for a long time afterward. Something that boxed cereal could never do. I often have homemade granola for breakfast. This is so easy, I wonder why I didn’t try it sooner! I initially saw a recipe on Food Babe’s blog called, The Perfect Parfait. Her recipe inspired me to try it. So good! I love how this recipe is very adaptable. You can really add whatever you like and change it up daily so you never get bored. I used a recycled pickle jar to hold my oats, but a mason jar would work well too. This is great for those mornings that you really have to rush. Rinse your groats beforehand. Throw everything in the jar the night before. If you like things a little sweet, you could throw in some chopped dates or raisins. Store in the fridge overnight. Just pull out and eat in the morning. Easy as that. This will be a breakfast I will have at least twice a week. I love it and I hope you will too. I am curious if it makes a difference if I make this in a plastic container instead of glass jar? I know a lot of people don't use plastics, but I don't have any glass jars right now and want to try this. Thanks! Is this dish supposed to be super chewy? I made it last night for this morning and was just surprised at how chewy it was. Thanks! The groats do have a little crunch to them. If you want them softer, you can soak them overnight, or just use rolled oats next time. Do you buy the vanilla beans already ground, if so where? Or do you ground them yourself, any instructions would be helpful as this is new for me? Thanks! How many does this serve? What size mason jar do you use? I use an 8 oz mason jar and the recipe is for one serving. It doesn't completely fill the jar. I have been making these for over a year now. I find you can freeze them, but i would keep them in there for over a month. Also i have added yogurt in with mine (whatever you prefer) for some extra flavor. And reduce the amont of liqiuds. Also frozen friuts can work great if you have them on hand. I find that the chia seeds are something not to be leftout! Thanx so much for all your different variations, going to try a few out today! Hi, I love oats and eat porridge made from rolled oats or steel-cut oats nearly daily, made with similar ingredients as your various overnight oat recipes, but I cook mine. I have done overnight oats only once ever, and I did them with rolled oats. I can see that steel-cut oats would be fine as well. But are you sure that whole oats (groats) are OK to be made like this? If you want to cook them, they require 45-60 minutes of cooking on a stove, unlike about 20 minutes for steel-cut. So I am just wondering if the groats would soften enough overnight to become edible, as they are like sealed dense little packages, unlike the steel-cut ones which essentially have 'windows' for the liquid to go in. Also, have you tried other grains this way? Would wheat and its relatives (kamut, spelt, rye) work if made in this way? I am thinking not, as those grains are harder than oats, and also have gluten which I am sure needs cooking. Otherwise I think wheat and its relatives done overnight would upset the stomach. So which other grains might work with the overnight method? Perhaps barley? Thanks! The oat groats have a crunch still in the morning. If you want them softer, soak them in water overnight prior to making the overnight oats. I worked up the courage to actually buy some whole oats at Whole Foods. They have been sitting there for about a month now because I am a little intimidated by cooking and especially something completely new. I have been eating oatmeal for breakfast for months now, and I add in walnuts and blueberries, etc, but it is Quaker Instant Oatmeal with dates, raisins and walnuts ... but only trace amounts. I am ready to try the next step, which I thought might be the raw oat groats as they call them. I just want whatever it is to be not too hard on my teeth as my teeth are kind of sensitive. When I looked at the cooking instructions, and the fact that they say many people do not eat oats because of how long they take to cook, I am wondering is that is exaggeration or what? How long would you have to soak oat groats for them to be easy to chew, or do you have to cook them for that. I am not sure I really want crunchy every day for every breakfast I have to admit I am a bit excited to be eating something so new and natural and I hope I can make it work out. Oh, I also would like to use almond or hemp milk, would that be OK. I like the idea of using chia seeds too, but I don't know much about them either. I am kind of new to this healthy WFPB way of eating. Can you make it with water instead of milk? I haven't tried so I'm not sure. If you try it, please let me know how it comes out. Do you have to use GF oats? I wasn't sure if this was a lifestyle/health choice or if non-GF would affect the outcome. Thanks! If you don't have a problem with regular oats, you can use them. In order to call the recipe gluten free, I need to state gluten free oats. Oats don't contain gluten, but they are often processed in plants that also process wheat. If you don't have a problem with gluten, just use regular rolled oats. 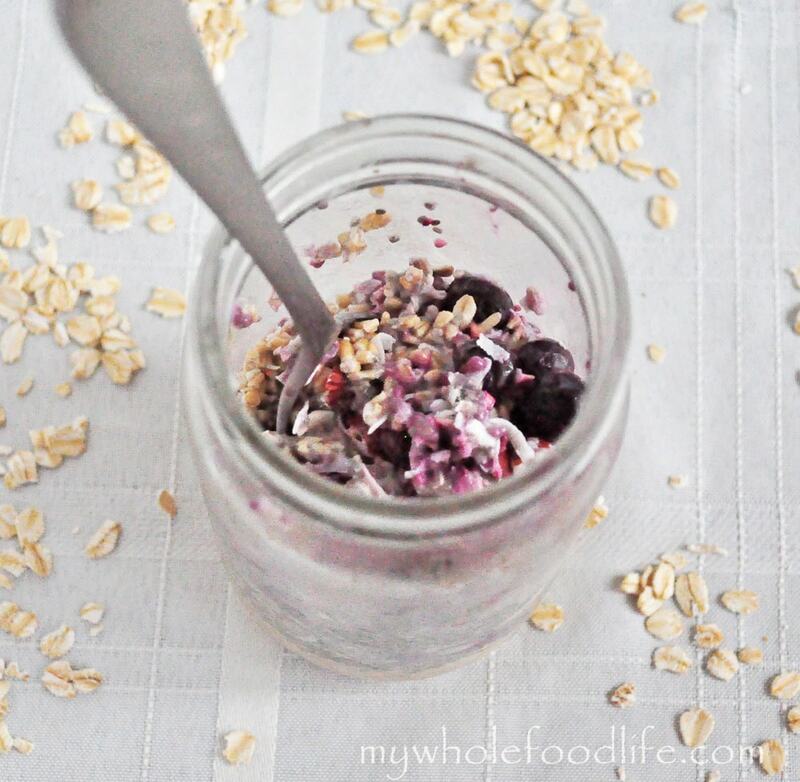 Pingback: Overnight Oats… More Mason Jar Magic! | Whole Foods Happy: A New Lifestyle: One Habit, One Change and One Step at a time!